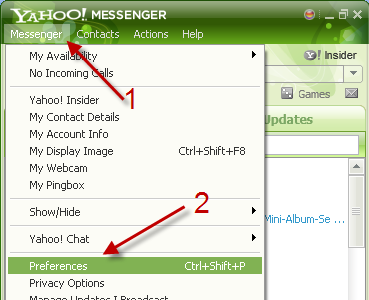 Unlike the older versions of Yahoo Messenger which display each conversation in a separate window, version 11 and later groups all conversations into one window through tabs. Fortunately, we can turn off the tabbed chat feature easily. Continue reading to find out how. In the older version of Yahoo, I used to use the Alt + Tab combination to switch between recent Yahoo conversations. With the new Yahoo version, I have to manually click on the tabs to switch the conversations. This is a huge pain. The tabbed chat feature is turned on by default to keep your taskbar organized, but the Windows 7 taskbar will automatically group the program’s windows so Yahoo’s grouping is not necessary at all. Here is how to turn this annoying feature off. 1. 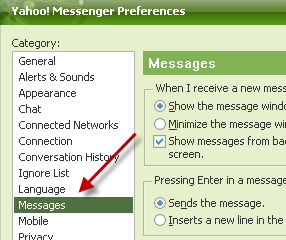 Launch Yahoo Messenger and log in to your account. 2. Click Messenger at the top of the interface to expand its menu, and then choose Preferences. You can also access the Preferences window by pressing Ctrl + Shift + P on your keyboard. 3. 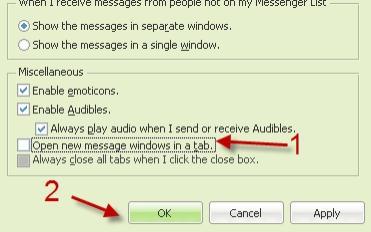 In the Preferences window, go to Messages on the left side. 4. On the right side, find the Miscellaneous section and uncheck the Open new message windows in a tab option. By unchecking this option, conversations will be opened in separate windows like in older versions of Yahoo. 5. Click OK to save the setting. When the warning window pops up, click OK again to confirm. Please note that after confirming the changes, all active chat tabs will be closed so make sure to save or finish any file transfer processes first. 6. Later, if you want to revert back to the tabbed mode, just choose the Open new message windows in a tab again.